Growing up in a small rice-farming village in 1980s Iran, 11-year-old Saba Hafezi and her twin sister Mahtab are captivated by America. They keep lists of English words and collect illegal Life magazines, television shows, and rock music. So when her mother and sister disappear, leaving Saba and her father alone in Iran, Saba is certain that they have moved to America without her. But her parents have taught her that “all fate is written in the blood,” and that twins will live the same life, even if separated by land and sea. As she grows up in the warmth and community of her local village, falls in and out of love, and struggles with the limited possibilities in post-revolutionary Iran, Saba envisions that there is another way for her story to go. Somewhere, it must be that her sister is living the Western version of this life. And where Saba’s story has all the grit and brutality of real life under the new Islamic regime, her sister’s life gives her a freedom and control that Saba can only dream of. Dina Nayeri was born in the middle of the revolution in Iran and moved to Oklahoma at ten-years-old. 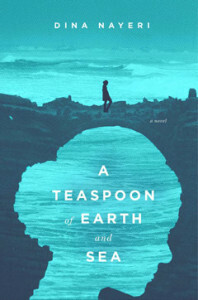 Her debut novel, A Teaspoon of Earth and Sea, was published in 2013 and translated into 13 foreign languages. Her work is published or scheduled for publication in over 20 countries and has appeared in numerous magazines like Granta New Voices or The Southern Review. Dina Nayeri holds both an MBA and a Master of Education from Harvard, and a BA from Princeton. Now she is at work on her second novel, also about an Iranian family, at the Iowa Writers Workshop where she is a Truman Capote Fellow and Teaching Writing Fellow. Fritzi Haberlandt reads from the German translation. Saba und Mahtab sind Zwillingsschwestern und bis zu ihrem elften Sommer unzertrennlich. Als Mahtab und ihre Mutter plötzlich auf mysteriöse Weise aus ihrem Leben verschwinden, bleibt Saba als halber Mensch zurück. Die Nachbarn raunen über einen Badeunfall im Kaspischen Meer und eine missglückte Flucht aus dem Iran. Doch Saba glaubt an ihren Zwillingssinn – und an eine ganz andere Geschichte. Ein kraftvolles, berührendes Debüt über Freundschaft, Treue und die Macht des Geschichtenerzählens. Dina Nayeri wurde während der Islamischen Revolution im Iran geboren und emigrierte als Zehnjährige nach Oklahoma. In Harvard absolvierte sie ihren MBA und Master of Education, in Princeton ihren BA. Ihr Debütroman Ein Teelöffel Land und Meer wurde bereits in dreizehn Sprachen übersetzt und als “Barnes and Noble Discover Great New Writers book” ausgewählt.